A man named Lomedjo was came to a jungle looking for a place to had meditation. Then, he found a small cave that suitable for his meditation, which is near to a pool. He named the pool as the 'blue pool' (Kedung biru). 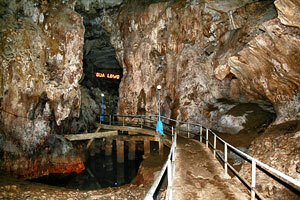 Its located is about 600 meters of Lowo cave (this place is still used for meditation place by some people).